Seeking an unusual and memorable romantic getaway to create new memories? Come experience our luxurious “glamping tent” accommodations. 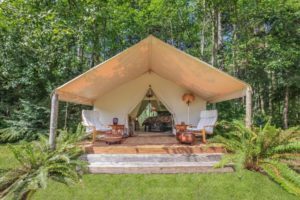 Set on 3 acres of quiet, natural beauty, our spacious and well-appointed 14’ by 16’ Davis Wall Tent is the perfect destination for a charming retreat. Click on “Make reservations here” below for more information. 4 rooms – Kids are welcome. 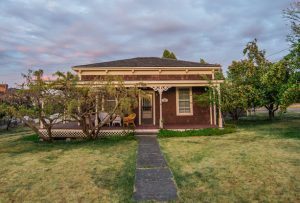 The Calista Cottage Vacation Rental is a historic house built in 1883 and is located in the historic town of Coupeville, overlooking picturesque Penn Cove. 3 rooms – Kids and pets are welcome. Step back in time. This historic inn is located right on Penn Cove. Includes restaurant and charming water view rooms. Also suitable for conferences, retreats, weddings, and other special events. 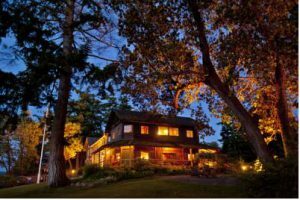 Choice of lodging in the Historic Inn, Lagoon Rooms or private cabins. 25 rooms – Kids are welcome. 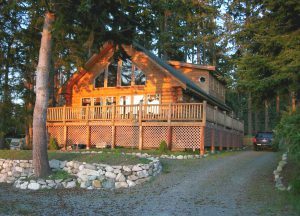 Enjoy the warmth of a real log home with spectacular accommodations and water view. Enjoy sunsets and all the special touches for a relaxing getaway. Breathe the fresh salt air, view passing ships, watch eagles ride the sea breeze or take the short walk to a private beach. The setting is just perfect! 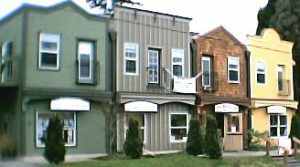 Come explore Lagoon Point and Whidbey Island. 2-3 rooms – Pets are welcome.